Looking for private in-home or in-studio Fiddle lessons? Our Emerson teachers are ready to get you started. Find your teacher today! Orange Blossom, Mississippi Sawyer and Devil's Dream are a few of the basic fiddle songs I like to teach. 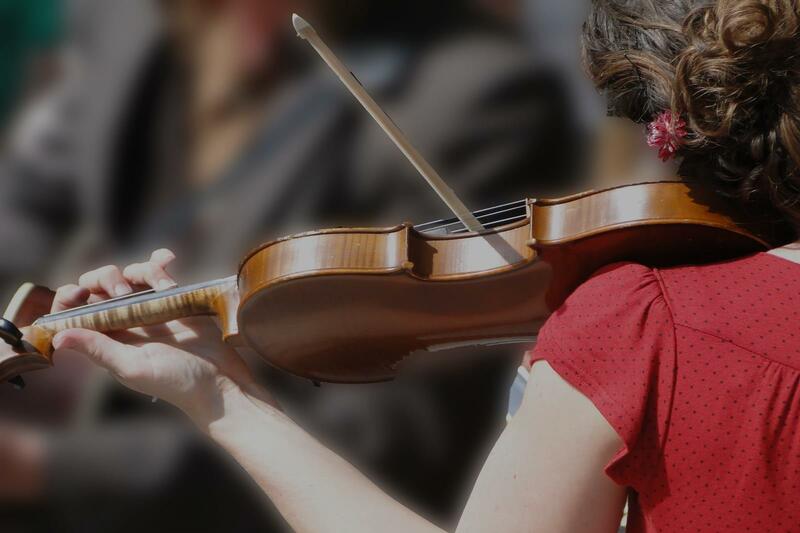 The key to Fiddling is being able to play in tune and fast with a few basic rhythm patterns. I teach theory, scales, rhythm, pattern recognition, how to work with a metronome from slow to fast, proper bow grip and placement as well as proper posture for the violin. My name is Erin. I am a graduate of the University of North Carolina at Charlotte. I have a Bachelor of Arts in Music, with a concentration in Violin. I began studying violin at the age of six. I have performed with small chamber ensembles, orchestras, quartets, and trios. I enjoy playing for churches and weddings, and love teaching. students' growth and abilities, and to provide an opportunity to give back to family and friends whose sacrifices and support enable the students to succeed. I teach because I love music and I believe God has given me a gift. Playing and teaching help me to use my talent for His glory. I love working with people and I love how music enables people of all ages to open up and express themselves in a positive way, no matter what life throws their way. I believe music teaches discipline, builds self esteem; helps set and achieve goals; and positively affects and enhances other curricular endeavors. My teaching philosophy is to always have fun while learning, to set attainable goals for the student, to learn through encouragement and discipline, and to help students come to love music on a personal level. I focus on the character of each student and their goals and desires to see that the student and/or parents are satisfied. Teaching is a privilege for me that I do not take for granted. I offer half hour, forty-five minute, sixty minute lessons, or longer on a weekly basis, but I do Not offer bi-weekly lessons. My lessons begin with the fundamentals of music. I believe a firm foundation in rhythm and reading is important because a student may switch musical instruments one day and the basics are universal and necessary. I have a deep love and appreciation for music which I hope to instill in my students as well. I am strict in the sense that I like students to polish their pieces before moving on. I like to keep them focused on playing well, not just playing. A typical lesson will begin with scales to warm up, a review of the previous week's material, and a new assignment. Students will memorize pieces, be proficient in scales and rhythms, and all the while laughing and having a great time. I am known with my students for my creative analogies and flexibility to try new things in order to adapt to the students strengths and weaknesses. My students look forward to coming to their lesson, and that is very rewarding as a teacher. I primarily use the Suzuki method for Violin and Viola, because it offers progressive steps to mastering technique, style, and musicality. My curriculum includes the use of Winning Rhythms, Wohlfahrt studies, All for Strings Theory, Essentials for Strings, and many more beginner and advanced studies; including shifting and double stops. I love music and I love working with people; teaching is just icing on the cake. I look forward to helping you achieve your goals and discover your talents and I hope we can learn together. I look forward to meeting you! I expect the student to have their instrument, and necessary accessories ie: rosin, shoulder rest, strings, books, and music stand. I teach Music on Violin, Viola, and Piano, as well as beginner cello. I am very creative in my teaching methods, though I use the Suzuki Method primarily for string instruments. I believe learning should be fun. I teach all the fundamentals of music from the beginning: counting rhythm, scales, reading music, theory. Erin is very patient and full of great ideas. She has helped me tremendously in only a few short lessons. Excellent and personable instructor that is able to quickly explain and teach the basics to a beginner! I have taught middle school orchestra for seven years and violin and fiddle private lessons for over 20 years. I perform professionally and have a repertoire of over 400 fiddle songs. Have you been playing for a long time, or have you never picked up the instrument before? Whether you are a child or an adult, I have a style of teaching for you. I've been playing since I was a child and have a special place in my heart for the is instrument. I actually began learning from a fiddle player and trained classically later. If you want to learn how to succeed in playing this exciting and thrilling style, this is the place for you. Students will start with a method book to learn simple melodies and double stops, more theory and technique will be taught from there using songs of student's choice. As a teacher, I am extremely upbeat and encouraging! I meet students where they are and seek to make lessons enjoyable as well as challenging. I am absolutely passionate about bluegrass and old-time music! I began playing viola in 1972 at age 9, switched to fiddle (violin) in 2003, and have been performing in bands as a bluegrass fiddler ever since! Teaching is in my blood, as I was a full-time high school English teacher for 32 years prior to my recent retirement. I've been teaching fiddle students for the past five years, and have helped many beginning and intermediate students learn how to play songs and continue building their skills. I work primarily with training by ear, but can also help students learn to read music. If you're ready to "pull out the fiddle and rosin up the bow," then give me a call! nt -- but it is also important to quickly gain the satisfaction of achievement. I like to help students learn how to play tunes and enjoy the instrument, as well as develop their skills through the hard work of exercises and drills. As students progress, they will learn what it takes to be able to jam with others. Let's get ready to fiddle! Julie is absolutely wonderful! She’s extremely patient and very talented. I was only able to take fiddling lessons for a relatively short amount of time (less than a year) but I feel that I walked away with an excellent start. Can not recommend enough! Julie is an amazing fiddle teacher! It is intimidating to take lessons as an adult and she made me feel very comfortable from day one. She is fun and has a laid-back, warm personality. I highly recommend her to anyone wanting to learn fiddle! Julie is an amazing teacher! She tells you what you need to improve in a gentle way and is always enthusiastic about any progress you make, no matter how small.